After an outbreak last year of toxic blue-green algae forced the cancellation of the first-ever Charles River swim race, organizers scheduled this year's event more than a month earlier to avoid a repeat. Now, two days before the race, the algae are back, threatening the event and the effort that transformed the river from an industrial-era soup to a sparkling waterway in which people could do the breast stroke. Fluorescent filaments of the organisms, known as cyanobacteria, began forming in the river last week, and by yesterday, they streaked the Esplanade lagoons a psychedelic green. The organisms secrete toxins that can irritate the skin, eyes, and ears of people who come in contact with it. Ingesting even a small amount of the tainted water could cause diarrhea, but a person would have to drink an enormous quantity to become seriously ill.
State officials plan to post signs today at Magazine Beach in Cambridge and along the Esplanade on the Boston side, warning people to be on the lookout for the telltale flecks, filaments, and mats of blue-green algae and to keep children and pets away from the water if they spot such indicators. State health officials say they have had no reports of any person or animal falling ill because of the outbreak. Fish and waterfowl appear unaffected. "This has the potential to affect the whole recreation season," said Kate Bowditch, director of projects for the Charles River Watershed Association, as she snapped pictures of the blue-green algae downstream of the Harvard Bridge yesterday. The Charles was the inspiration for the 1960s Standells' song "Dirty Water," but the state and federal governments have since spent millions of dollars to scrub the river clean of litter, sewage, and industrial waste. "The outbreak is disappointing, but I don't feel discouraged that we are not making progress in the river; we are," Bowditch said. "But this is the next thing we need to focus on." Last week, tests showed little toxicity in the Charles. But since then, the bloom has visibly grown and may have become more potent, prompting officials to plan another round of tests today and tomorrow. Based on those tests, officials will decide tomorrow if the race is still on. State, federal and community environmental and health officials are gathering today to discuss the results of samples collected so far. 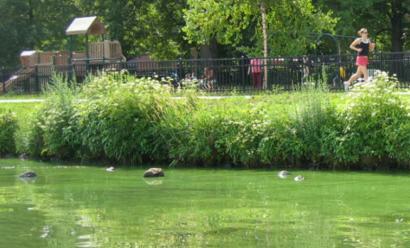 Blue-green algae are not true algae, but cyanobacteria. They are usually present in amounts so small they are harmless, but can undergo exponential growth spurts when exposed to nutrients contained in contaminants such as lawn fertilizer and Canada goose droppings that wash into waterways. State and federal environmental officials suspect that this year's bloom is occurring now because of optimal conditions for growth: lots of sunshine, warm water, and low water levels that concentrate nutrients. Scientists are uncertain exactly why water levels are low, but say it appears related to rainfall totals upstream and the amount of water communities are using. The cleaner Charles may even be partly to blame. As water visibility improves, light can penetrate deeper to reach the microorganisms and jump-start their growth, a federal environmental official said. "We're seeing better clarity toward the mouth of the basin . . . but that is where we are seeing some of this algae," said Tom Faber, a water quality engineer for the US Environmental Protection Agency in Boston. The EPA is about to release new guidelines that govern how much phosphorus, a key nutrient, can be in the river. Those guidelines are expected to spark efforts to control nutrients flowing from roadways, stormwater pipes and other sources. "We need to reduce those levels of nutrients," said Bruce Berman, of Save the Harbor/Save the Bay, an advocacy group. "We're taking substantial steps to inform the public [about the outbreak] but we still need to do more to address this problem." This year's outbreak is small compared with last year's, when more than 1 million cells per milliliter of water were recorded near the Museum of Science. State officials post advisories if cell counts exceed 70,000 cells per milliliter. So far, only one test result -- at the Charles River Dam on July 10 -- exceeded that count. As for the swim, organizers are hoping that more rain in the forecast will reduce algae levels enough to allow the event to go forward. However, if it rains too much, the race could be canceled because of bacteria washed into the Charles.